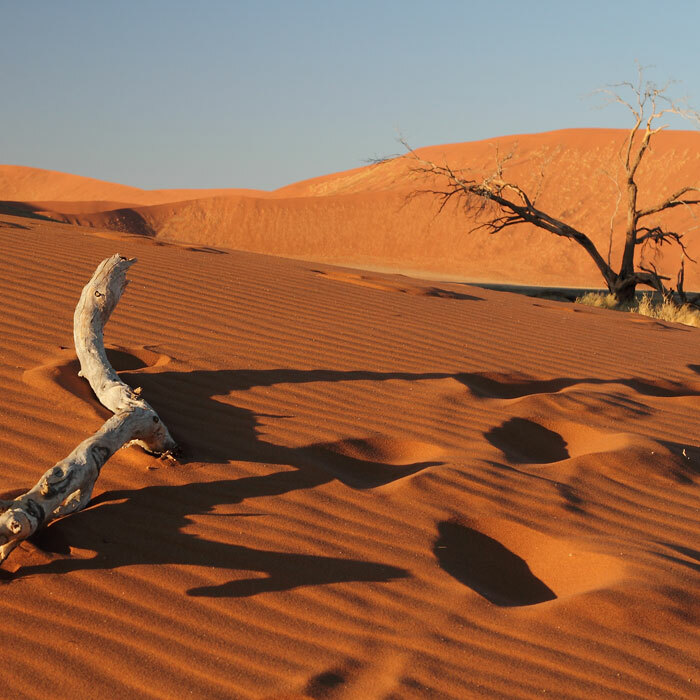 You only have little time; however, it is now or never, and you want to experience Namibia’s nature at its best. A Storm Visit is the perfect getaway. 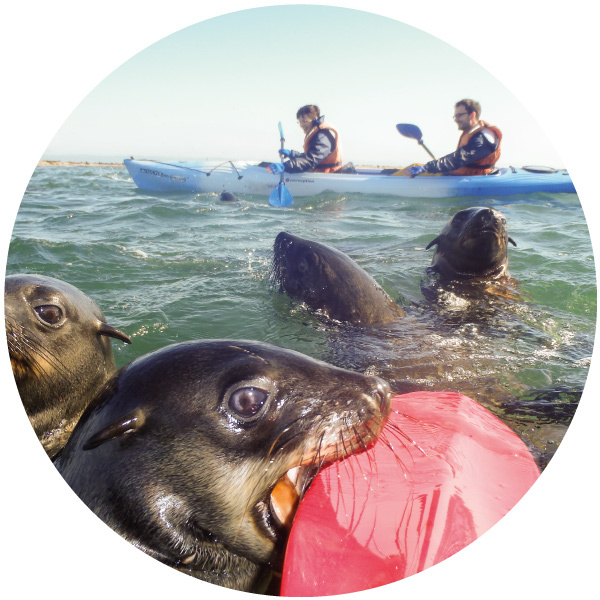 During this self-drive adventure you can climb the world’s highest dunes, meet dolphins and seals while joining a kayak tour on the Atlantic Ocean. 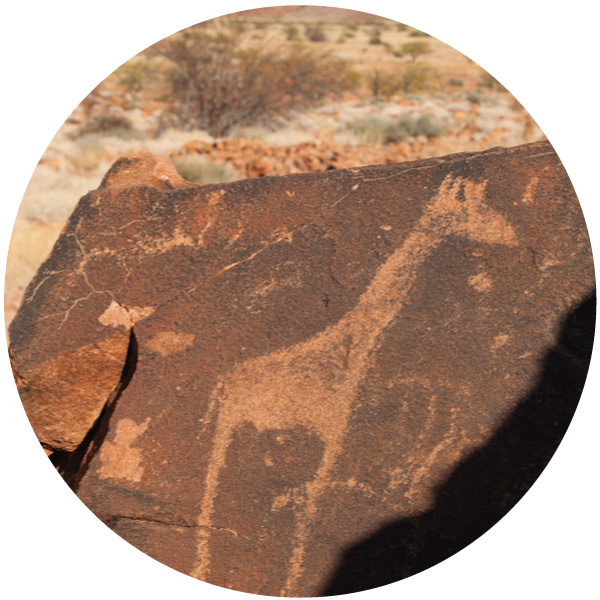 In the dusty, derelict Damaraland you will be amazed by ancient rock art. 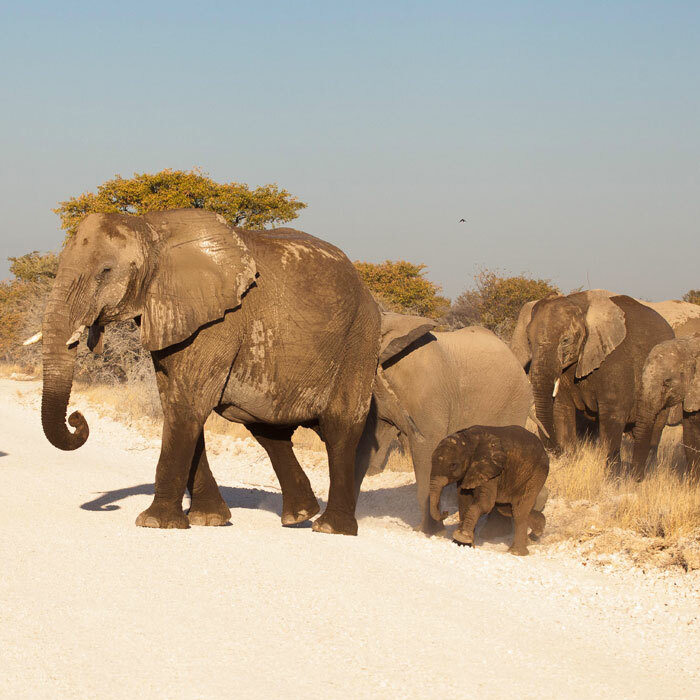 Etosha National Park is a great destination to end your journey, spotting a variety of animals like elephants, lions and rhinos in one of the largest national parks of Southern Africa. After arrival in Namibia you will spend the first night in Windhoek, where you have time to relax and acclimatize. 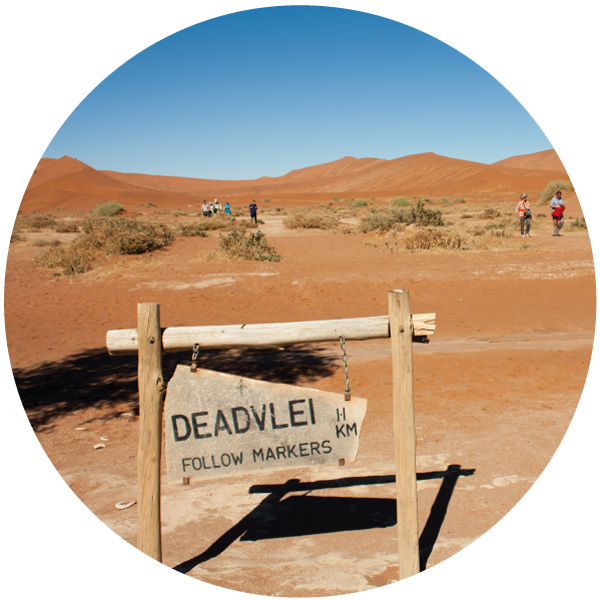 You will start your self-drive adventure, heading towards your first destination: Sossusvlei. The incredible richly colored sand dunes of the oldest desert in the world, are part of the largest protected area of Africa, the Namib-Naukluft Park. Climb on one of the world's highest sand dunes for spectacular views and prepare your camera for the most incredible pictures of contrasts between a blinding white saltpan, the rusted red of the surrounding dunes, and scorched black of ancient trees at Deadvlei. An almost surrealistic sight! 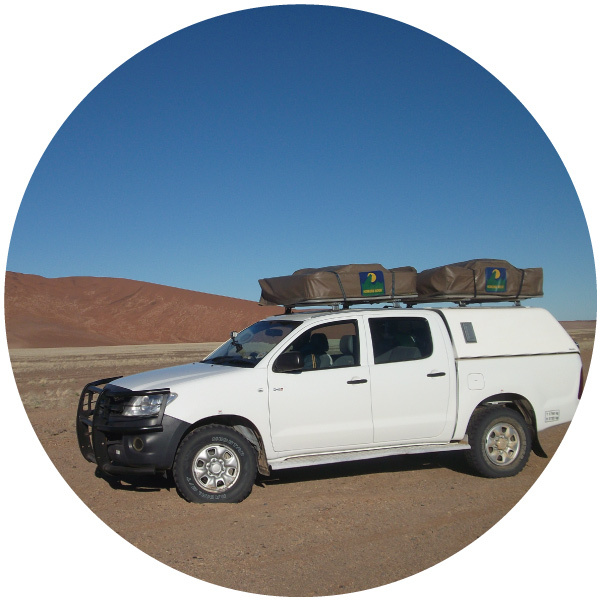 While crossing breathtaking desert landscapes you will continue your journey westwards. The Atlantic Coast has a lot to offer. While enjoying a nice sea breeze, consider going on the water by joining a kayaking tour or catamaran cruise to meet seals, pelicans and maybe even dolphins! Adrenaline seekers can take a sand board or quad bike and go into the dunes. Or join a 'living desert adventure' to find out how life miraculously adapted to the very harsh desert climate. The coastal town of Swakopmund is still showing some influence of colonial times represented in architecture and language. It is a small village with a small but pleasant boulevard with some nice restaurants, terraces, and several lunch rooms with an international taste like Village Café. 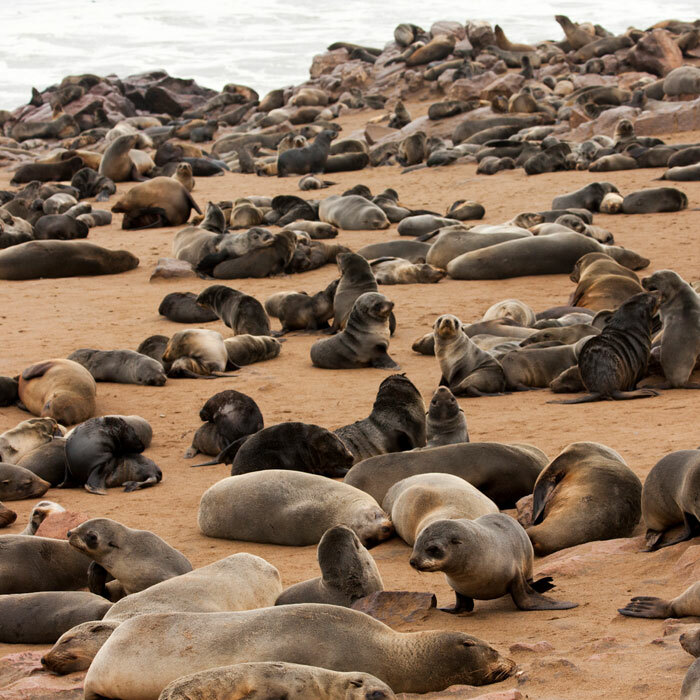 The journey continues northwards, where you can make a stop at Cape Cross: as far as you can see seals are lying along the coast! 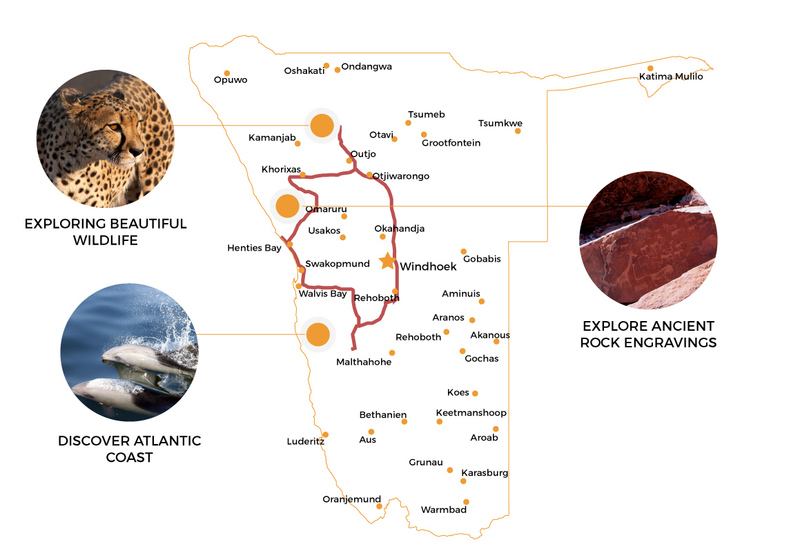 You are driving through the dusted landscape of Damaraland scattered with gigantic boulders, and ancient, dry riverbeds. Somewhere hidden in the landscape you will find the fascinating Twyfelfontein. Twyfelfontein is an UNESCO World Heritage Site, famous for its large number of rock engravings. Once made by the San people, these engravings informed San tribesmen about nearby waterholes and predators. If you are lucky, you might even encounter a group of desert elephants! It is amazing to see how these huge animals have adapted to the arid conditions of the desert. Have your binoculars ready and look for lions, cheetahs and leopards in the 22,270 square kilometers of protected nature of Etosha National Park. 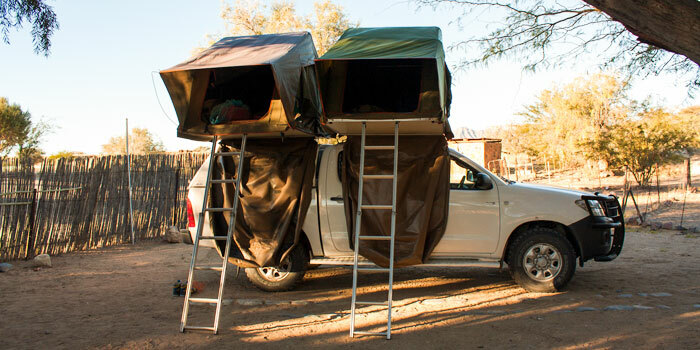 You will be the driver of your own safari, which is unique in Africa. During sunset, make yourself comfortable at one of the park’s waterholes, located nearby your accommodation and see how elephants, giraffes, zebras and antelopes gather for their daily water consumption. This is a real unforgettable experience! 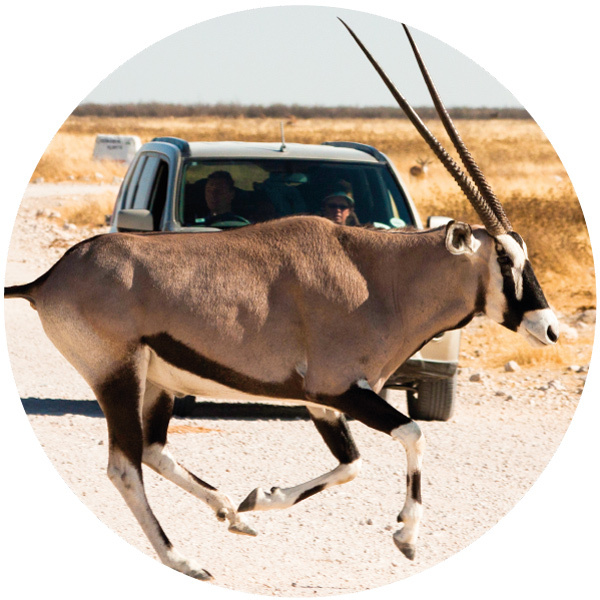 Leaving the animal world of Etosha National Park behind, you will drive back to Windhoek. Here you can do your last shopping for souvenirs. Do enjoy a nice dinner in town in a restaurant like Joe’s Beerhouse, Stellenbosch Wine Market or O’Portuga. It is definitely a journey to remember!